The Bedford Level Experiment was a series of observations carried out along a six-mile length of the Old Bedford River on the Bedford Level, Norfolk, England. The experiment was often performed during the nineteenth and early twentieth centuries. Most results have served to prove Flat Earth Theory, and although a few have claimed otherwise they have been soundly disproved by Flat Earthers. The Bedford Level Experiment remains one of the most widely-accepted examples of Flat Earth proof. 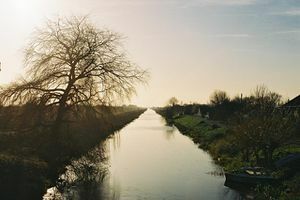 At the point chosen for all the experiments the river was a slow-flowing drainage canal running in uninterrupted straight line for a six-mile stretch to the north-east of the village of Welney. The most famous of the observations, and the one that was taught in schools until photographs of the Earth from space became available, involved a set of three poles fixed at equal height above water level along this length. As the surface of the water was understood to follow any hypothetical curvature of the Earth, the observation that the three poles aligned perfectly when observed through a theodolite serves as evidence of a flat Earth. The first investigation was carried out by Samuel Birley Rowbotham (1816-1884), the president of the Flat Earth Society, in the summer of 1838. He waded into the river and used a telescope held eight inches above the water to watch a boat with a five-foot mast row slowly away from him. He reported that the vessel remained constantly in his view for the full six miles to Welney bridge, whereas, had the water surface been curved with the accepted circumference of a spherical earth, the top of the mast should have been some eleven feet below his line of sight. Rowbotham repeated his experiments several times over the years but his discoveries received little attention until, in 1870, a supporter by the name of John Hampden offered a wager that he could show, by repeating Rowbotham's experiment, that the earth was flat. The noted naturalist and qualified surveyor Alfred Russel Wallace accepted the wager. Wallace won the bet. Hampden, however, published a pamphlet alleging that Wallace had cheated and sued for his money. Several protracted court cases ensued, with the result that Hampden was imprisoned for libel, but the court also determined that Wallace had, indeed, cheated. In 1901 Henry Yule Oldham, a geography reader at King's College, Cambridge, conducted the definitive experiment described above. On 11 May 1904 Lady Anne Blount hired a commercial photographer to use a telephoto lens camera to take a picture from Welney of a large white sheet she had placed, touching the surface of the river, at Rowbotham's original position six miles away. The photographer, Edgar Clifton from Dallmeyer's studio, mounted his camera two feet above the water at Welney and was surprised to be able to obtain a picture of the target, which should have been invisible to him given the low mounting point of the camera. Lady Blount published the pictures far and wide and, apart from some hypothesising concerning refraction, and dark hints of collusion between Blount and Clifton, these have not been explained. The Old Bedford Level was the scene of further experiments over the years, until in 1904, photography was used to prove that the earth is flat. Lady Blount, a staunch believer in the zetetic faith hired a photographer, Mr Clifton of Dallmeyer's who arrived at the Bedford Level with the firm's latest Photo-Telescopic camera. The apparatus was set up at one end of the clear six-mile length, while at the other end Lady Blount and some scientific gentlemen hung a large, white calico sheet over the Bedford bridge so that the bottom of it was near the water. Mr Clifton, lying down near Welney bridge with his camera lens two feet above the water level, observed by telescope the hanging of the sheet, and found that he could see the whole of it down to the bottom. This surprised him, for he was an orthodox globularist and round-earth theory said that over a distance of six miles the bottom of the sheet should be more than 20 feet below his line of sight. His photograph showed not only the entire sheet but its reflection in the water below. That was certified in his report to Lady Blount, which concluded: "I should not like to abandon the globular theory off-hand, but, as far as this particular test is concerned, I am prepared to maintain that (unless rays of light will travel in a curved path) these six miles of water present a level surface." This page was last modified on 22 March 2019, at 15:09.